It seems to me on higher difficulties there are two ways to go about your day. 2. Live in the woods. TIS are evil. I'm evil (when it comes to thinking of ideas) and it occurred to me that sheet ropes are fantastic method to escape a house when it's on fire but they're certainly not a great thing to rely upon long term. I mean think about it logically. You tie some bedsheets together or worse, jumpers or pants and you use that to scale two stories (or more!) to your house every day and down every morning. Now let's assume for a moment that you've been incredibly careful tying the knots and the cloth is good quality that still wouldn't account for weather and general wear and tear from use. Example: Like I say, I'm a little bit evil. It would be fantastic to catch a new player out. A player who has spent weeks doing work on his safe-house but didn't have the presence of mind to put more than one sheet rope from his safe house. One day he starts scaling down his sheet rope and it detaches/breaks and the player sprains his ankle or worse a fracture or a break. Worse of all, now the player has no method of getting back to their safe house so now they have a fractured leg and no safe house and they probably left most of what they consider important upstairs. I know I would. The exception might be if you actually used a rope instead of a sheet rope but even then weather will play it's part. The rope will fray and eventually break depending on the amount of traffic it sees. That isn't conjecture, the sheet rope/rope will break. It's a case of when, not if. The heavier the weather, the greater the extremes between hot and cold would both play a large part. So the idea here is that you either find or construct a ladder. A found ladder would be unlikely to break but it would be a liability if zombies were about. It's not a stretch of the imagination to speculate that a zombie could knock this ladder over. This too would make for a very interesting game mechanic. 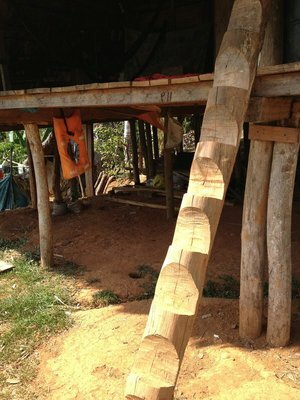 It's not unrealistic to imagine that a wooden ladder could be constructed. Again it's safety could be dependant upon the carpenter who built it. Build a ladder at level zero and it'll be a rickety piece of crap and more likely to kill you than help you but at level 10 it'll hold firm in an earthquake. There should be an option to attach the ladder to the wall. Applying the aforementioned about constructed ladders it would seem sensible to take a constructed ladder and then nail it to the wall so it's secure. I would imagine that would require some alteration so it's stands out from the wall a little otherwise your hands and feet would not be able to get purchase on the ladder. I appreciate that ladders *must* have been discussed before so just remember I don't check to see what's been discussed because I feel that in the process of writing this I'm bound to have touched upon something someone else has missed. And as ever, I'm just throwing around ideas. If you don't like the idea then hit me in the stomach please, not in the face. That's where the magic happens. Note: For that picture I googled 'man falling from sheet rope' and that was the first image I found. I censored it just in case someone gets offended. I know, nobody ever gets offended on the internet but I thought I'd play it safe. Having ladders would add a new option at least. Assuming you can place it from below It would allow you to climb up to otherwise inaccessible areas. No one wants to sleep on a roof under the stars on a foldable chair but it's certainly preferable to being zombie food. I also like the notion of 2 ladder types. You could have an option to pull the free standing ladder up with you after you've climbed it so you can use it again to get down somewhere else (assuming the zombies don't knock it over before you can grab it!). Fastened ladders obviously would require skill and tools to install and remove. Lifting the ladder is something I hadn't considered. It's a good idea but I think it'd be limited to the strong because you'd not only have to lift it up you'd also have to lift it through the window. That would mean supporting it horizontally too. I think that'd be quite difficult. I suppose if the ladder was aluminium then it might be different but even then I think it'd still be quite difficult. And that doesn't even account for the width of the ladder and the window respectively. I like your thinking though.